PIERRE, S.D. – The South Dakota Game, Fish and Parks (GFP) Commission proposed changes to a Clark county water body, Indian Springs, regarding its seasonal boating restrictions. One change would prohibit the discharge of a weapon from a boat and the other would prohibit boat fishing from Oct. 10 – Dec. 31 on waters west of a half mile, east of 427th Avenue within Indian Springs. The proposal would not impact ice fishing opportunities. 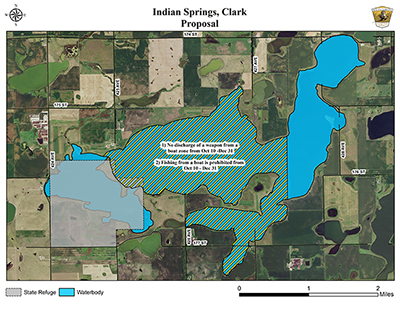 A public hearing for this proposal will be held on Sept. 6 at 2 p.m. CDT at Lewis and Clark Resort in Yankton. Individuals can also provide written comments on proposals by sending them to 523 E. Capitol Ave., Pierre, SD 57501, or online at https://gfp.sd.gov/forms/positions/. To be included in the public record and to be considered by the Commission, comments must include a full name and city of residence and meet the submission deadline of 72 hours before the public hearing.